An iconic brand changes hands. “A long chapter in media history has come to an unlikely close,” said Sydney Ember and Andrew Ross Sorkin in The New York Times. 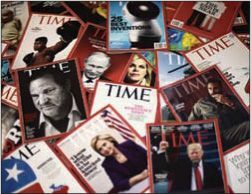 Time Inc., the “once prestigious” Manhattan-based publisher of Time, People, and Entertainment Weekly, was sold this week to Iowa-based publisher Meredith Corp.—owner of titles such as Family Circle and Better Homes and Gardens—for a deal worth $2.8 billion, including the assumption of $1 billion in Time Inc. debt. The deal was underpinned by “an infusion” of $650 million from the private equity fund of Charles and David Koch, “the billionaire brothers known for using their wealth and political connections to advance conservative causes.” The deal suggests Time believed it couldn’t survive “the wrenching shift from print publishing to digital publishing” on its own, said James Peltz in the Los Angeles Times. Both Time and Meredith have “struggled to replace shrinking print ad revenue” as readers have migrated to online platforms, but Meredith hopes that the combined company’s wider stable of titles “will draw more advertising dollars and other revenue in the digital age.” Meredith CEO Stephen Lacy dismissed concerns that the Koch brothers would use the publications “to promote their brand of conservative politics,” insisting they “desire to be passive” investors. Detroit auto executives this week asked Vice President Mike Pence “to pump the brakes” on some of the Trump administration’s proposed reforms to NAFTA, said Keith Laing in DetroitNews.com. The group, which included executives from GM, Fiat Chrysler, and Ford, told Pence that the changes “could add thousands to the cost of a car in the United States.” The industry is deeply concerned about a proposal to increase “the minimum percentage of parts that must be made in the U.S. for a car to qualify for duty-free treatment under NAFTA.” The next round of NAFTA talks will begin Jan. 23 in Montreal. Tumblr chief executive David Karp is resigning from the microblogging platform he founded more than a decade ago, said Nick Statt in TheVerge.com. Karp, 31, informed staff of his departure this week. “My decision comes after months of reflection on my personal ambitions,” he said. Tumblr was purchased by Yahoo for $1 billion in 2013, after which the company wrote down its value by more than half and “a dizzying string of mergers and acquisitions” led it to its current home, the Verizon-owned media conglomerate Oath.